Punjab and Haryana high court on Thursday asked the concessionaire, Delhi Gurgaon Super Connectivity Limited ( DGSCL), the Gurgaon police and all others concerned to put their heads together to resolve all outstanding issues to smoothen the vehicular traffic at the toll plaza on the Delhi-Gurgaon Expressway. The high court directed the National Highway Authority of India (NHAI) to improve the condition of the Delhi-Gurgaon Expressway and service lanes near the Sirhol toll plaza in Gurgaon at the earliest for the smooth flow of traffic. The division bench comprising justice S K Mittal and justice Amol Rattan Singh, hearing the petition filed by the concessionaire, Delhi-Gurgaon Super Connectivity Limited (DGSCL), also directed all the parties concerned in the case to convene a meeting before the next date of hearing and inform the developments to the court. During the arguments of the case, the Haryana government’s counsel informed the court that the NHAI was not taking the case seriously and there was a need for the maintenance of road and service lanes near the toll plaza. The Gurgaon police informed the court that authorities were conducting meetings at regular intervals to ponder over the issue and to make the toll plaza less congested for smooth flow of vehicles. Justice S K Mittal said that he would himself be making a visit to the Sirhol toll plaza in a day or two to get a first-hand account of the ground situation. He also cited an example where a serious patient could not reach the hospital in time due to the traffic jam at the toll plaza. However, justice Amol Rattan Singh asked the Haryana government to also look at the condition of traffic snarls at Karnal toll plaza where sometimes the traffic comes to a halt for almost on a distance of one kilometre. What does the new-age buyer want? Customers almost always come with a checklist these days, especially in suburban areas where we do gated communities. In Chennai, proximity to schools, health facilities and security are of great importance. They are not looking for super luxury but a good lifestyle at a low ticket price. How different is it being an FDI developer in a traditional market? In some sense, in the real estate market, we see ourselves as game changers. The real estate market usually has family-run businesses or one-man businesses but being a corporate body with an independent board helps us remain objective. There is no personal agenda and our projects are all from the capital provided by funders such as Morgan Stanley and Goldman Sachs. You have announced a few financial innovations (such as pay nothing until possession after the initial 20 per cent). Is this your reaction to the current market scenario? While we continue to believe that the market is as robust as ever, our innovation is an effort to reduce the financial burden on potential homeowners. Consider a typical buyer — a couple with double income, buying a home on loan. They apply for the loan and until possession they have to carry the burden of their rent and the EMI. Sometimes, projects are delayed due to approval issues and in these cases they save a lot of time with this offer. There has been a marked increase in villa projects along OMR and GST over the last one year. What explains this? We find that the Chennai customer wants to stay as close to the ground as possible. That’s probably why high-rises don’t catch their fancy as much as villas do. You own your own piece of land and it comes with the option of expansion later. In our projects, we are offering expandable villas that come with a pre-approved plan for expansion. Owners can build another room anytime they want to and not even necessarily through us but any builder. 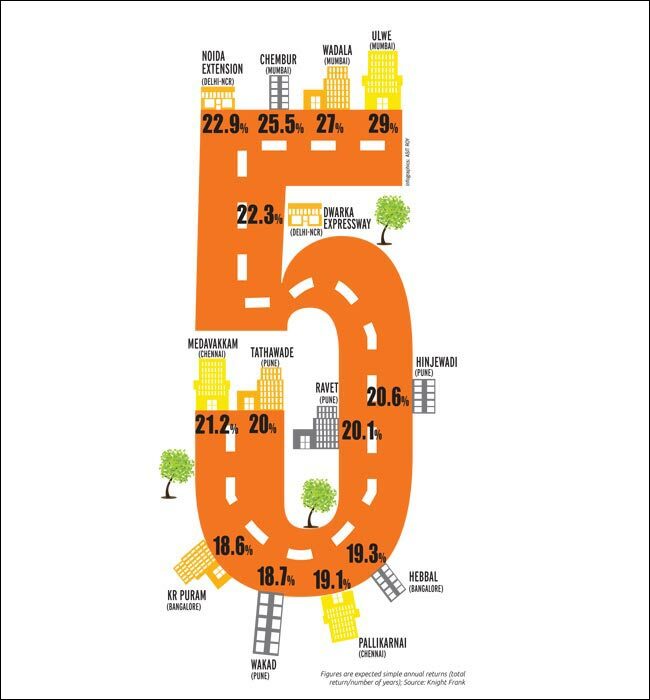 Infrastructure-wise how does Chennai compare with other markets? I don’t think a lot of people even know that Chennai has seen the highest amount of FDI in the last two to three years. A lot of activity is happening, especially around the Oragadam area, and a detailed Master Plan with more structure will take the city to a higher platform almost certainly. Property developers who have been holding onto high prices despite falling demand, especially in the luxury segment, are finally changing course. They are not dropping prices yet, but are holding back new launches and focusing on relatively affordable homes, industry researchers said. New project launches came down by 16% in 2012 compared to 2011 levels, and high-end and luxury segments saw a drop of 24% and 23%, respectively, says a report by real estate consultants Cushman and Wakefield (C&W). “Of the number of units launched, a majority were launched in the middle segment comprising 83% of total launches,” the C&W report said. Developers consider one and two-bedroom flats in Mumbai and upto three-bedroom flats in Delhi to be middle income. Those above this are considered luxury property. Industry experts say that real estate companies are also facing liquidity issues as bankers have become cautious about lending to the sector. While private equity deals were visible till the first half of 2012, it has come down sharply in the second half. 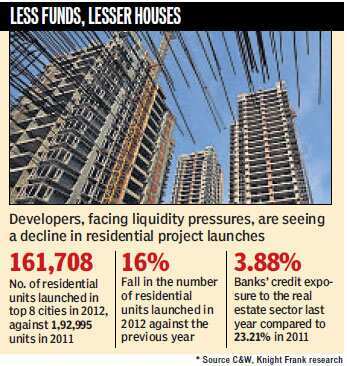 “Banks’ credit exposure to developers has fallen from its peak growth rate of 23.21% in June 2011 to 3.88% as per the latest reported data on September 2012,” a separate report by Knight Frank India said. “The demand of residential apartments has come down substantially but prices have remained high and in some cases developers have increased prices, especially in the National Capital Region (NCR) and Mumbai. Now a correction is taking place and prices are not likely to increase for next 18-months,” said Pankaj Kapoor, managing director at realty research firm Liases Foras. Increasing share of peripheral markets are likely to keep prices under check, especially in Mumbai and the NCR, the Knight Frank report said. The analysts say controlled new supply of apartments in the NCR, primarily in new sectors in the Gurgaon area, will likely keep a check on the quantum of unsold stock. The delay in the completion of the Northern Peripheral Road (NPR) is causing financial loss to thousands of homebuyers and real estate developers who have invested their money in projects along the multi-crore project. The investors will have to wait at least three years to reap the benefit of the much-hyped corridor. Scores of projects are coming up here. “The buyers and builders are worried as overall value of the land and flats along NPR has gone down in the past two years,” said a member of the National Real Estate Developers’ Council (NAREDCO). The decline of land value has burnt a hole in the pockets of real estate players. The 18-km road, also known as the Dwarka Expressway, is likely to be completed by April 2015. 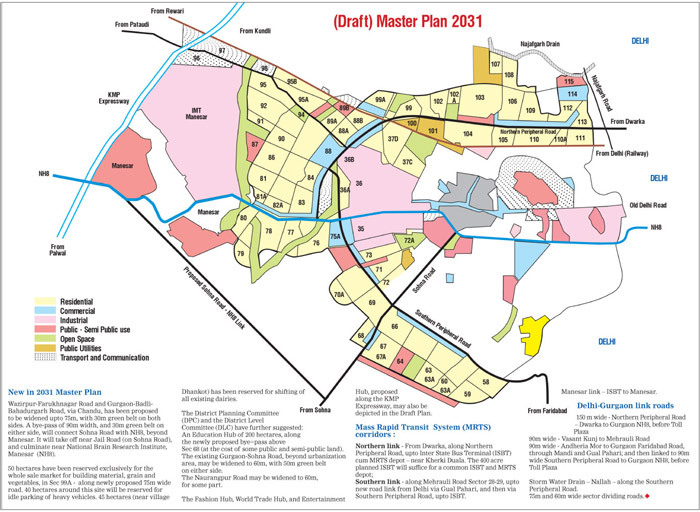 According to the latest project status report submitted to the state government by the Haryana Urban Development Authority (Huda), the completion of the stretch in 2015 will be subject to vacation of stay order on some portion and allotment of alternative plots to the people likely to be displaced from its 4-km stretch in New Palam Vihar and elsewhere. 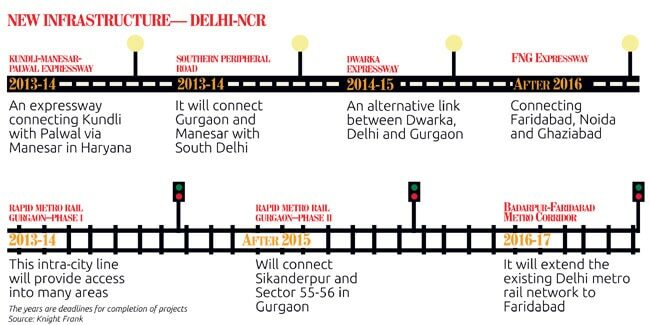 The NPR is being built under the public-private partnership (PPP) model and will provide connectivity between Dwarka and NH-8 at Kherki Daula. About 200 residential and commercial projects are coming up along the stretch. At present, out of the total length of 18 km, work is underway on 14-km stretch. The project report says the construction work on the 14-km stretch is slow as only 8-km portion is ready with bituminous work. The project has already missed its earlier deadline. The stretch was supposed to be completed by March last year and the total 18-km road by end of 2012. Huda, later on, extended the deadline to December 31, 2012 and end of 2013, respectively. The Huda report does not mention, unfortunately, about penalty on the contractors responsible for the delay on the 14-km stretch. JSR Construction Private Limited and India Bulls Construction Ltd are jointly constructing the 14-km stretch. A sum of about R28 crore has been spent till date out of total estimated cost of R57 crore. Pankaj Kumar, chief engineer, Huda refused to comment on the delay when contacted by the Hindustan Times.The construction work is hampered by several reasons including legal cases against the land acquired by Huda for the project. Several cases are pending in the court. Common Areas shall mean all such parts/areas in the project which the allottee shall use by sharing with other occupants of the project including entrance lobby, driver’s/common toilet at ground floor, lift lobbies, lift shafts, electrical shafts, fire shafts, plumbing shafts and service ledges on all floors, common corridors and passages, staircases, mumties, services areas including but not limited to lift machine room, overhead water tanks, helipad, underground water tanks & pump room, electric sub-station, DG set room, fan rooms, Laundromat, maintenance offices/ stores, security/ fire control rooms and architectural features, if provided. Super Area of the Said Apartment if provided with exclusive open terrace(s) shall also include area of such terrace(s), Apartment allottee however, shall not be permitted to cover such terrace(s) and shall use the same as open terrace only and in no other manner whatsoever. a) Sites for shops and shop(s). b) Sites / Buildings/ Area of Community facilities/ Amenities like Nursery/ Primary/ Higher Secondary School, Club / Community Centres, Dispensary, Creche, Religious Buildings, Health Centres, Police Posts. Electric Sub-Station, Dwelling Units for Economically Weak Sections/ Services personnel. c) Roof / top terrace above apartments excluding exclusive terraces allotted to apartments/ Penthouses. d) Covered / Open Car Parking Area within / around Buildings for allottees / visitors of the project. There are many definitions, however Let me explain in simple terms. It is the area under the roof of your appartment which can be exclusively used by the buyer. In other words built up / appartment area minus the walls. Some also exclude balconies from built up, but for all practical purposes, I consider the above simple definition. All buyers pay for super area but exclusively use appartment / built up area. In other words we pay for “Loading” or common areas as well. There is no standard or norm for “loading” % in RE. All that depends on the architecture, size of the project, amenities and density of the project. The common “Loading” % is usually seen between 25-28% of Super Area, which means we pay BSP for so much of non exclusive space. However many projects have loading beyond 35%. Hope with the above terms explain what we actually pay for and what we actually get to live-in finally. A decision to buy a property must be based on the appartment to super area ratio. Don’t think you pay for eg Rs 4500/ sft as BSP, but you may actually pay 6250 for the appartment / built up area in which you are going to live-in or which you can call your exclusive home. Also decision not just be based on loading % alone. One must also take into account the density of the project. Density means in simple terms, no of dwellings per acre of land, while there may be many other words such as FAR etc used. A project may have lesser loading but of high density. For eg Bestech Ananda in sec 81 has the lowest / best loading number -25% but the project is high density 720 units in 13 acres i.e, 56 units per acre. As the no of units go up within acre the loading comes down. Any project with above 45 units per acre can be considered as high density. In high density projects the no of dwellings per acre and no of human beings living per acre would be high. In laymen terms, comparing south delhi to chandini chowk, not in literal terms, but used the example to make one understand. Hope the above explanations help people decide logically what they are actually buying. PS: I would like to thank Mr. Krishna of IREF for this post.